Word-for-word translations seek to translate the ancient Hebrew and Greek of the biblical text word-for-word into English as far as possible. They also try to translate the same Hebrew or Greek word consistently throughout the Scriptures, even when the context of a given verse might encourage a different translation of that word for the sake of style and ease of reading. Indeed, word-for-word translations can often read clumsily since Greek and Hebrew syntax and sentence structure can vary widely from English syntax and sentence structure. Thought-for-thought translations seek to take phrases or even sentences from the Hebrew and Greek biblical text and translate them according to the intent of the biblical authors using smooth, readable English. This is helpful for understanding, but can also lead to misunderstandings because sometimes the biblical syntax, no matter how convoluted and confusing it may appear, is important to understanding the argument of a biblical writer. Paraphrases consult other English translations of the Bible, along with some Greek and Hebrew texts as well, and then they paraphrase these other translations into contemporary, readable English. Paraphrases are dangerous because they often explicitly, and sometimes even recklessly, reflect the theological biases of their paraphrasers. With this brief review of translational philosophies in mind, I wanted to offer a couple of additional thoughts with regard to translating Scripture. First, it is important to note that Bible translating is more of an art than a science. Oftentimes, people will ask me what the best translation of the Bible is. The fact of the matter is, there is no one translation that I can recommend wholeheartedly as the “best” because, finally, Bible translating is an art! This means that there are some translations of the NIV that I prefer while, in other places, I prefer an ESV or an NASB rendering. In a couple of instances, the old KJV still carries the day for me! This is why, rather than simply recommending a single translation, I encourage people to compare several translations, giving the benefit of the doubt to the word-for-word translations over the thought-for-thought ones, and then consulting a commentary to shed further light on the text. Second, it is important to note that there is no such thing as a “literal” translation of the Bible. Whether it is a word-for-word or a thought-for-thought translation, every translation involves some level of translator interpretation, especially when an ancient biblical text is especially ambiguous or when its idioms are unintelligible to the modern reader. The example I gave in ABC last weekend comes from Acts 20:37 where, after Paul says his farewell to his beloved Ephesian congregation, and with much weeping and sadness, the Ephesians, according to a word-for-word translation of the Greek, “were throwing themselves upon the neck of Paul.” Whoa! I know the Ephesians were sad to see Paul leave, but they didn’t have to try to break his neck! But this misunderstands the idiom. Even the NASB, considered by many to be the most faithful word-for-word translation available, translates this verse, “They embraced Paul.” And indeed, this is an appropriate translation. For even if the NASB does not translate woodenly the ancient idiom, it does faithfully reflect the author’s intent in using the idiom. Thus, to find a “literal” translation is neither possible nor is it always necessarily helpful. What is man that you are mindful of him, the son of man that you care for him? You made him a little lower than the heavenly beings and crowned him with glory and honor. You made him ruler over the works of your hands; You put everything under his feet. Thus, the preacher of Hebrews sees this Psalm as referring not only to humankind generally, but also to Jesus singularly! The Psalmist, writing some 1,000 years before Christ, prophecies concerning Christ! To discard the masculine singular pronouns, then, in favor of more generic plural inclusive pronouns, obscures the Messianic character of this Psalm. And that is a tragedy. For Christ is the center of the Scriptures. Thus, I tend to caution people against translations that commit themselves to inclusive language at the expense of Greek and Hebrew grammar and syntax. So where does all this leave us? To use a phrase coined by President Reagan, we should “trust, but verify.” I advise people, with few exceptions, to generally trust the translations they read and not worry about missing a huge theological theme because of a faulty translation. Reading any major translation, you will still discover the gospel that Christ has come to die on a cross in your place for your sins apart from anything you do. No major doctrine of Christianity is compromised by any major translation. 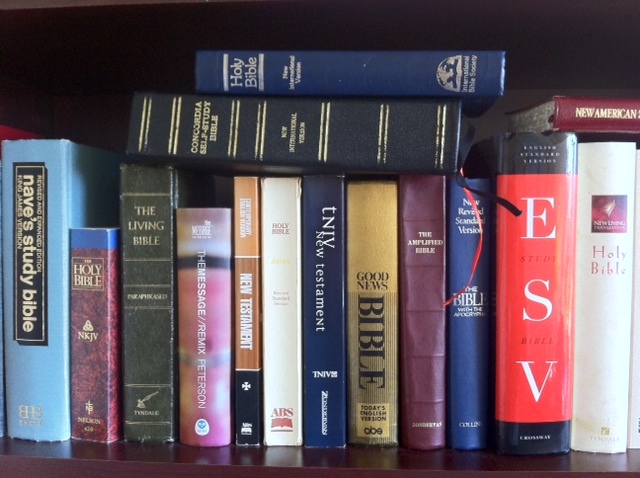 However, I still encourage people to verify confusing or disputed passages by consulting other translations, commentaries, and their pastor. This can help bring clarity and orthodoxy to some sticky passages. So get to reading! The people have God have spent a lot of time translating the Word of God. And they’ve translated it so that the Word of God can be read and believed by you. Entry filed under: ABC Extra. Tags: Bible Translations, Dynamic Equivalence, Formal Equivalence, Greek, Hebrew, Literal, NIV 1984, NIV 2011, Paraphrase, Thought-for-Thought, Word-for-Word. Hi, Zach! As Dr. Brighton used to say, when one uses a translation, he uses, at best, a commentary. All of your post has been, at one time or another, my counsel to those who seek advice on which Bible translation to use. Usually, my parting counsel is this: When you come upon a difficult passage or word that you simply can’t get your head around, call your pastor, tell him to look it up in the original language, and then explain things. By the way, my favorite, wooden though it is, is the NASB.